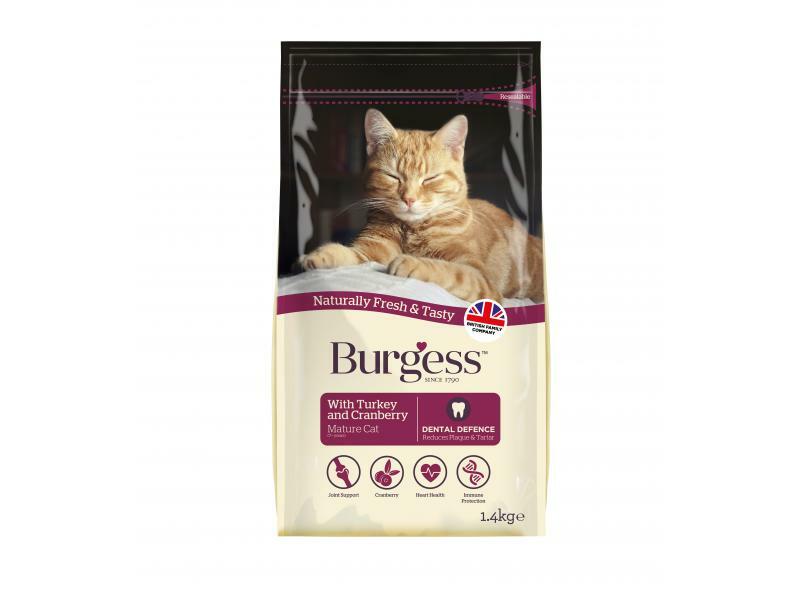 Burgess Turkey & Cranberry Mature Cat Food is a high in protein food for mature cats. It has delicious crunchy kibbles and contains all the protein, vitamins, minerals and taurine needed to help keep your cat happy and healthy in its golden years. It has natural antioxidants and taurine, STAYClean coating for healthy teeth and gums and no artificial colours or preservatives. Hydrolysed Chicken Meal, Maize, Wheat, Rice, Maize Gluten, Poultry Fat, Fish Meal, Turkey (min 4%), Chicken Liver Digest, Yeast, Egg, Monocalcium Phosphate, Salt, Minerals, Fructo-oligosaccharides 0.3%, Cranberry 0.65%, Glucosamine Hydrochloride 0.03%, Stay – C50 700mg/kg. Vitamin C - 315mg/kg from Ascorbyl/Monophosphate Sodium Salt. Tocopherol Rich Extracts of Natural Origin 100mg/kg. There are currently no questions for Burgess Turkey & Cranberry Mature Cat Food - be the first to ask one!